Existing amenities in the lower park will be enhanced. Improvements include replacement of the existing playground with a nature-based play space, new picnic tables and stoves, and new parking areas. This area will also provide a backdrop for a future Local Art Park. The proposed overpass will connect the upper and lower parks. Pedestrians will be able to take advantage of new vantage points from the overpass to experience the Edmonton skyline. Design to be completed in summer 2015, construction will take place from August 2015 to November 2015. 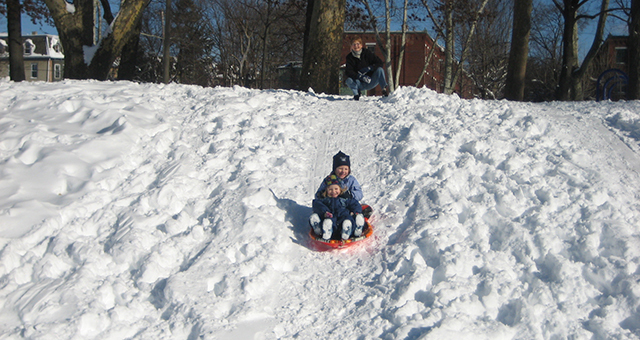 A large mound is proposed in the lower park for tobogganing. The pedestrian overpass will connect to the top of the mound. A fire pit at the bottom of the hill will provide a warm viewing area. A large, flat, grassed area at the foot of the toboggan hill will be uniquely located to support a variety of small events and public gatherings. This area will be supported by a new year-round amenity building with washrooms, a drinking fountain, seating, a warm-up area and a fire pit. 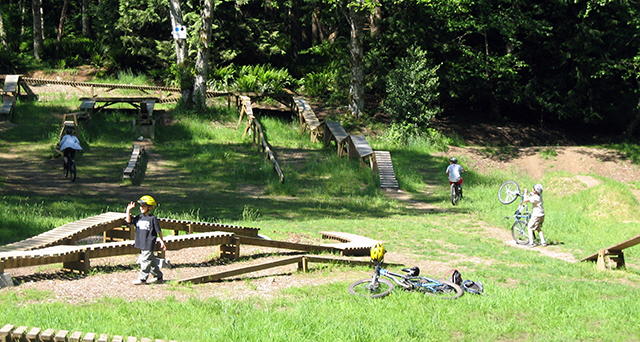 This park is proposed to consist of a bike skills area and single track trails. The design of the bike skills park will be done in collaboration with a skills park designer, the biking community and the City. Partnerships will be explored to ensure the park is well-maintained and to foster environmental stewardship through engagement with the mountain biking community. Widening of two existing trails: the trail that runs north of the stairs at 105th Street and the trail that connects to Fort Hill Road. A new trail is planned to join these two trails, just north of the O’Keefe Site. Saskatchewan Drive winds its way along the top of bank and offers some impressive panoramas of Edmonton’s skyline. Improvements will be made to lookouts above Queen Elizabeth Park near 106th Street, and between 104th and 105th Streets. Improvements will be made to entrances to Queen Elizabeth Park from Saskatchewan Drive to allow for better viewing and clearly marked entrances. The existing granular parking lot will be paved for easier access. A new parking lot exit will allow for safer entry back on to Queen Elizabeth Park Road. A raised crosswalk and textured hard surface at the parking lot turnaround will help to create pedestrian-friendly zones in the parking area. A staging area includes a small shade shelter and picnic area and a commemorative wall will trace the outline of the old pool. Panels will interpret the recreational history of the park and the old Queen Elizabeth Outdoor Pool. The Indigenous Art Park is being developed in collaboration with the Edmonton Arts Council. The Art Park Curator, Candice Hopkins, provides guidance and direction for the overall park design. Representatives from the City of Edmonton, Edmonton Arts Council, Confederacy of Treaty Six First Nations, Metis Nation of Alberta, Elders and Aboriginal artists and community members form a steering committee, which provides direction on community engagement and will help to choose a name for the park. The Indigenous Art Park will have granular pathways with unmown grasses and wildflowers where possible to create a natural environment. An asphalt trail will provide a wheelchair accessible route. The artists have been selected and the locations of their art pieces are shown in light green geo metric shapes. Additional information on the site and the art park can be found on the City's Indigenous Art Park webpage. A new accessible asphalt walking trail is under construction at 106th Street on Saskatchewan Drive down to Queen Elizabeth Park Road. The lower trail is complete, and the upper portion below the Lawrence Decore lookout is expected to be complete by the end of July 2016. The Queen Elizabeth Park Master Plan was approved by City Council in 2013. It will guide the phased development of the park. Improvements in the upper park include the ᐄᓃᐤ (ÎNÎW) River Lot 11∞ Indigenous Art Park, upgraded or new lookouts along Saskatchewan Drive, a new shade shelter and picnic tables and development of a new accessible trail into the park from Saskatchewan Drive. Proposed improvements in the lower park will include an integrated bike skills park, toboggan hill, improved picnic and play areas and a new washroom building. 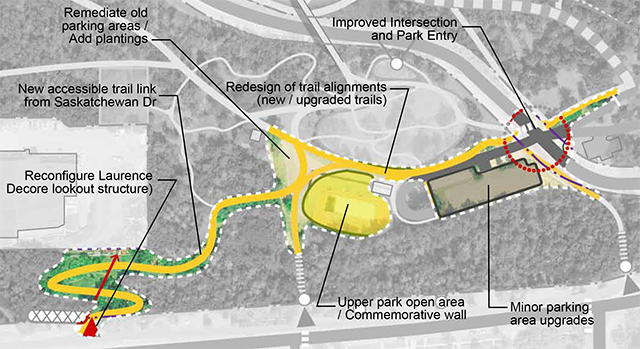 A new pedestrian overpass is planned to connect the upper and lower parks. Funding was approved by City Council to begin implementing the master plan in 2014. The first phase of this work included the construction of an accessible, asphalt walking trail from the lookout at 106 Street and Saskatchewan Drive to Queen Elizabeth Park Road. The new trail was completed and opened to the public in July 2017. The second phase of construction will include improved amenities throughout the upper park. 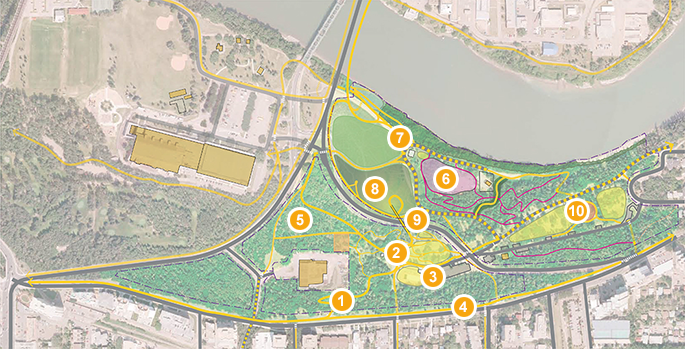 The Indigenous Art Park named ᐄᓃᐤ (ÎNÎW) River Lot 11∞, was developed in collaboration with the Edmonton Arts Council. More detailed information on the art park can be found on the Edmonton Arts Council website. Future improvements in the lower park, presently funded, include a bike skills park, steps down to the river, an all-season washroom building, new trail connections, upgraded picnic and play areas, interpretive elements, a toboggan hill, an overpass over Queen Elizabeth Park Road and additional space for a permanent and transitory public art. A new accessible asphalt walking trail has been constructed from the lookout at 106 Street on Saskatchewan Drive down to Queen Elizabeth Park Road. Trail construction was completed in July 2017. The Indigenous Art Park was developed in collaboration with the Edmonton Arts Council. The Art Park Curator, Candice Hopkins, provided guidance and direction for the overall park design. Representatives from the City of Edmonton, Edmonton Arts Council, Confederacy of Treaty Six First Nations, Metis Nation of Alberta, Elders and Aboriginal artists and community members form the steering committee, which provides direction on community engagement and helped choose a name for the park - ᐄᓃᐤ (ÎNÎW) River Lot 11∞. ᐄᓃᐤ (ÎNÎW) is a Cree word meaning “I am of the Earth”. The art park is situated on ancestral lands of the Indigenous peoples whose descendants entered into Treaty with the British Crown which resulted in the territory opening for settlement. River Lot 11 acknowledges the historic river lot originally home to Métis landowner, Joseph McDonald. The park is located within Queen Elizabeth Park in Edmonton’s North Saskatchewan River Valley. The art park has granular pathways with unmown grasses and wildflowers where possible to create a natural environment. An asphalt trail will provide a wheelchair accessible route. The artists have been selected and the locations of their art pieces are shown in light green geometric shapes. The Indigenous Art Park construction was completed in August 2018. The old granular parking lot is paved for easier access. A new parking lot exit will allow for safer entry back onto Queen Elizabeth Park Road. A raised crosswalk and textured hard surface at the parking lot turnaround will help to create pedestrian-friendly zones in the parking area. The Shade Shelter, Parking Lot and Picnic Area construction was completed in August 2018. The Queen Elizabeth Park Master Plan has been prepared to guide the phased development of the park over the next 10 years.